KVS Recrutiment 2019 for Teaching and Non Teaching job profiles. 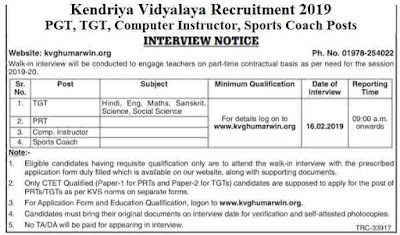 KVS Recruitment department published a notification in their official website related to the recruitment process of various posts. They also published this notification on the " The Tribune Newspaper" published on 30th Jan. 2019. Direct Walk in interview will be conducted to engage teachers on part-time contractual basis as per need for the session 2019-20. 1. Eligible Candidates having requisite qualification only are to attend the walk in interview with the prescribed application form duly filled which is available on our website, along with supporting documents. 2. Only CTET Qualified (Paper-1 for PRTs and Paper-2 for TGTs) candidates are supposed to apply for the post of PRTs/TGTs as per KVS norms on separate forms. 3. For Application Form and Education Qualification, logon to www.kvghumarwin.org. 4. Candidates must bring their original documents on interview date for verification and self-attested photocopies. 5. Those who are going to be appeared in this Interview round for selection under this KVS Recruitment 2019 will not get any TA/DA for appearing in interview. Applicants who have a Graduation’s /Master degree in any science subject/Mathematics from recognized university of India with postgraduate Diploma in Computer application from government recognized university / institute. Applicants having a Post-Graduation degree in any subject with Postgraduate Diploma in Computer application from government recognized University/’O’ level from DOEACC. a) Senior Secondary School Certificate with 50% marks (or) Intermediate with 50% marks or its equivalent, with JBT or B.EL.ED. b) Those who passes in the Central Teacher Eligibility Test (CTET) conducted by the CBSE. Hindi ,English. Science, Social Science, Maths, Sanskrit. Graduation Degree with at least 50% marks in the concerned subjects/ combination of subjects and in aggregate. 2). Should pass the CTET Examination. Graduation Degree with at least 50% marks with any two of the following subjects: “History, Geography, Economics and Pol. Science” of which one must be either History or Geography. Graduation with B.P.Ed / N.IS. / SAI / SAT. 16TH Feb. 2019 is the Interview Date.